Home » How To Guide » How to Choose the Best Table Saw? Are you looking for a table saw and feel stuck? Well, this is the right place and you will be able to get all information that is needed to buy a table saw. A table saw is a power tool that has a number of advantages. This tool will allow you to make angular cuts accurately. There are so many different types of table saws and at times picking the best one may be quite a challenge. If you have never used a table saw before, you may find it difficult to make a decision on which one should be chosen. Fortunately, we have done all the work for you and put together this comprehensive buyer guide. We will look at all details that pertain to the table saws. The portable saw is quite unique and the distinguishing factor is the fact that you can easily move it around from one point to another. In most cases, they come with a compact and collapsible design, which makes it convenient to store and transport it. This is a larger table saw and comes with a larger working surface. With the contractor, the table is usually heavy and quite difficult to move around. It will accommodate large work pieces like plywood. If you have a huge workshop, then this would be the ideal table saw. It is quite heavy and large and cannot be moved at all. Among all the types of table saws, this is the most accurate and is quite powerful. The hybrid table saw is known to be a combination of all the different features of all the other types of table saws. For instance, while it is quite large and does not have wheels, it is easily portable. It is smaller than the contractor saw and can be used in a workshop or basement. The choice of your table saw will highly depend on the specific use of the saw. When you have found the right type of your table saw, you need to look at the specific features that will address your needs in the best way possible. Miter gauge: This will serve as a guide which you can easily adjust so as to move the stock through the blade and made the angular cuts. Click Here for reading the more information about Best Saw Miter Gauge. Rip Fence: This another essential component which is in the form of a bar that will serve as a guide for your work piece at it goes past the saw blade. Bevel Mechanism: This is a system that will make it possible for you to tilt the blade so as to make bevel cuts conveniently. There are a number of table saws which are portable and this would make them ideal for deck building or framing. They are also ideal for places with limited space. As for the stationary models, they are heavier and larger and will only be operated from a fixed point. However, they have large workspaces and versatile features than the portable table saws. Direct-drive motors: These are motors that will link directly to your table saw blade and thereby transfer all the power from the motor to the blade. Belt-drive motors: With this option, they come with a belt that will be used to transfer the power from the motor to the blade. These motors tend to last longer since they are offset away and not affected by the sawdust. However, you should keep checking the belts for wear and tear as well as the tension. When you have the belt-drive configuration, you would need to take preventative measures frequently. Mobile Stands: If you have a stationary table saw, these stands will provide mobility. Such stands come with casters that will keep the saw rigid while in use due to the lock mechanism. If you have a limited space, the portable table saw stand will be facilitated the movement of the table saw from one point to another. Dado Sets: If you have shelving and joinery tasks, then you will need the Dado sets. These are used to make wide cuts and straight slots with a single pass. Support or Extension Tables: The main purpose of the extension is to provide more working space and enhance the stability of the table saw when working on larger or wide stock. Blade Guard: This is meant to protect you from a number of instances like kick back, contact with the saw blade or getting debris and dust from the blade. Amps: This refers to the amount of power that the motor has. A motor with high amps will give you maximum cutting power. Mobile Stands: The main purpose is to provide mobility and enhance the stability of the table saw. Shaft Lock or Arbor: This will immobilize the blade and the shaft so as to make it easier and safer to change the blade. Rip fences that are extendable: This is the feature that will give you more rip cutting capacity when you need it. You can easily fold it or spread it out to serve the purpose. Micro-adjust Rip Fence: This gives you absolute control and high quality cuts. Blowers or Dust Chutes: This is essential in removing the dust from your work area, giving you more visibility. with a hardened finish on the tips that make the cuts. Rip Blades: If you want to make cuts along the wood grain, you need the rip blades. Combination Blades: These are versatile and will be useful for mitering, crosscutting as well ripping. Hollow ground blade: This is the right blade when you need to make clean cuts on various types of material like acrylic. Crosscut blades: For purposes of making cuts across the wood, this would be the ideal blade. What to Look for in the Best Table Saw? A good table saw is one that has adequate horsepower on the monitor. This will determine the ability to be able to cut different types of material without a problem. As such, when you are considering the type of table saw to buy, you should never ignore the horsepower of the motor. In addition, you should also consider the voltage when factoring the power of your motor. The smaller table saws will have a horsepower that ranges from 1.5 to 2, while the larger ones will have 3 to 5 horsepower. This is an essential factor to consider when choosing your table saw. Ideally, the main reason why you would be buying s table saw is to be able to make accurate cuts effortlessly. When choosing the right table saw, you should consider one that is able to cut through any type of material easily. As far as the accuracy goes, you should ensure that the miter gauge is accurate so as to make bevel cuts, rip cuts as well crosscuts with utmost precision. Table saws have different ways to manage the dust that comes from the cutting process. You may get one that has a port on the back, which is attached to a vacuum. This will corral the dust that will collect below the table saw. There are others that come with a shroud that is over the blade and this will redirect the dust that is collected above the table saw. The best table saw is one that can have a combination of both features so as to ensure that you have ultimate dust control. You can also get a slanting chute, which will help redirect the dust to the main dust port. The fact that the table saw is a power tool means that it can actually cause serious injuries in the event of an accident. As such, it is important to consider a model that has a wide range of safety features. For instance, you need to go for one with flesh detection technology, such that when your finger or any other part of your body is caught by the blade the machine stops. You should also check for anti-kickback features which is a safety feature that prevent the stock from being catapulted in your direction. While this may appear to be an unnecessary feature, it is quite significant. Just as the name implies, this is a magnetic switch that will automatically switch the table saw off if it loses power. This is quite safe, unlike the traditional saw which will stay in the on position even when power is lost and will power up as soon the power is restored, which can cause a whole lot of damage. The magnetic switch is a safety feature as well and in the event of power loss, it will go off and prevents any unintentional start. As you may already be aware, the table saw is operated using hand and as such if there is a potential risk, your hands are tied. To prevent such instances, you need to consider a table saw that comes with a kick switch or pedal, which can easily be reached using your knee or foot. This means that if your hands are about to be caught by the blade, you can easily reach the switch and hit it to switch off the machine. This is quite useful and should be taken into serious consideration when choosing your table saw. A table saw is a long term investment and as such, you would want one that would last for a very long time. As experts, we recommend getting a table saw that has all its parts made of metal and not plastic. This is quite durable and you should consider the ones with a cast iron surface. The surface, legs and other parts should be sturdy and this is the only way you can be sure that your table saw is ideal. The durability of each part, especially the motor and other moving parts is essential. It is also advisable to check the warranty issues so as to be safe with the table saw you choose to purchase. Remember we mentioned that you should consider the configuration of the table saw. A good table saw is one that has a drive belt that will transfer the power from the motor to the blade. This is the main reason why the table saw will vibrate. If you mind the vibration, then you should consider the Poly-V belts, which are found in high quality table saws and produce less vibration. 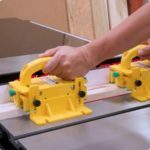 The best table saw that will give you a smooth operation without vibration is one that uses the poly-v belt. In order to save on time and get to work fast, you need to find a table saw that is easy to adjust and use. For instance blade alignment should be easy so as to make it easier to achieve accurate cuts, without a problem. You should ensure that the wheels or casters, as well as the levers on the table saw, are working perfectly without any problem. It would be advisable to check the compatibility of the table saw with some of the basic components and accessories that we discussed earlier. Portability: If you intend to be using your table saw at different job sites, then it is advisable to consider portability. This means looking at the overall design and dimensions of the table saw to ensure that it fits your vehicle. If it has a stand, choose one with a collapsible design and functional wheels. Power Requirements: It would quite frustrating to choose a table saw that you cannot use due to power limitations. Check the available power in your shop or basement to ensure that it serves the purpose. 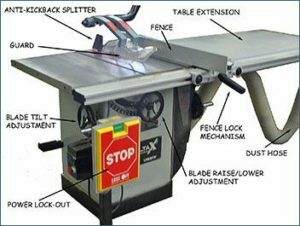 In most cases, table saws need a 20 to 30 amp circuit to run properly without a problem. Availability of Space: How much space do you have in your shop or home? This is an essential consideration when buying a table saw. The cabinet table saws are usually large and require a permanent place to be fixed. 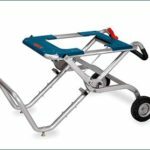 If you have limited space then you may need to consider the portable table saws. Cutting Power: It is also advisable to consider the type of materials that you will be cutting. This will give you a hint on the amount of power that you will need to accomplish your tasks effectively. It is worth noting that the amount of power that the table saw produces is highly dependent on the horsepower from the motor. With these considerations, you should be able to choose the best table saw without much of a problem. There are so many different types of table saws on the market. As if that is not enough, there are so many brands made by different manufacturers. As a result, this may be quite confusing for an average buyer. We sincerely hope that using this guide, you can be able to make an informed decision and choose the best table saw. If this comprehensive guide provided great insights, please feel free to share it around with your friends and loved ones. There several people are also interested about Drill press table for their regular work. It will be helpful and time consuming for you. You can also look for drill press table beside best table saw.